BACKGROUND: The Affordable Care Act (ACA) initiated federally and state-run health insurance exchanges, or marketplaces, with health plans offering subsidies for plan members as well as coverage for essential health benefits, to help individuals, families, and small businesses find health plans that fit their specific needs. 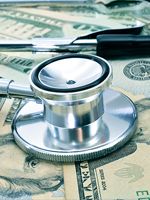 A recent study found that the value of these healthcare subsidies varied with the number of health plans in the different geographic rating areas, but that study only examined the premiums and the deductibles of those health plans. OBJECTIVES: To examine the value of subsidies of health plans, including cost-sharing for prescription drugs in the health insurance marketplace. METHODS: We have used publicly available health plan data from HealthCare.gov and from county population data obtained from the US Census Bureau in June 2015. The average-weighted premium; medical deductible; medical maximum out-of-pocket spending; and cost-sharing for generic drugs, preferred and nonpreferred brand-name drugs, and specialty drugs were calculated for the second lowest-cost silver plan in each geographic rating area. These were then compared across geographic areas with different numbers of plans to determine the value of the subsidies. We also compared the difference between the cost of the average silver plan and the second lowest-cost silver plan for each area to determine the cost to enrollees if they selected the average silver plan. RESULTS: The monetary value of the subsidies provided by health plans was lower in areas with a larger number of plans, because the second lowest-cost silver plans in these areas tended to have lower premiums and higher deductibles. For the most common type of cost-sharing for generic and for preferred brand-name drugs, plan enrollees would likely have a lower or similar copayment if they selected the average-cost silver plan instead of the second lowest-cost silver plan. However, they may end up paying approximately $8 less in copayment for nonpreferred branded drugs and approximately 4% less for coinsurance after a deductible for specialty drugs if they resided in a geographic area with fewer than 11 plans. CONCLUSION: The value of subsidies provided by the ACA-initiated health plans in the healthcare marketplace, including cost-sharing for prescription drugs, varies across geographic areas with different numbers of health plans. This suggests that potential enrollees should consider cost-sharing for prescription drugs in addition to health plans’ premiums and deductibles when choosing their health plan. The Affordable Care Act (ACA) initiated health insurance exchanges, or marketplaces, with health plans offering subsidies for plan members, to help individuals, families, and small businesses find health plans that fit their specific needs. By the end of the first open enrollment period, more than 8 million Americans selected qualified health plans through the ACA-initiated health insurance marketplace, and by February 2015, more than 10 million people enrolled and paid for health coverage through those plans in these marketplaces.1,2 Under state and federal rules and regulations, the ACA allowed insurers to offer a variety of well-defined health insurance plans and compete through the marketplace. However, lower-premium plans typically have higher out-of-pocket costs (eg, higher deductibles and higher maximum out-of-pocket spending),4 which accumulate later in the benefit year after enrollees utilize healthcare services, or less generous essential health benefits (ie, drug coverage; provider network; and copayment or coinsurance for primary care physicians, specialists, and emergency department visits, and for drugs). Basically, enrollees in these plans need to consider the difference between the premiums of the second lowest-cost silver plans, the subsidies they obtain, and the additional out-of-pocket payments in their geographic rating areas, along with the essential health benefits. A recent study by Jacobs and colleagues demonstrated that higher insurer competition is associated with lower health insurance premiums in the federally run marketplace.6 Conversely, Taylor and colleagues used first-year data from health plans in the marketplace to investigate the premiums and deductibles of the second lowest-cost silver plans across various geographic rating areas to understand the choices faced by people living in different areas; they found that more health plan choices may reduce the value of the subsidies to enrollees.4 Yet, other financial attributes (eg, maximum out-of-pocket spending and cost-sharing for essential health benefits), which are parts of a health plan’s values, have not been examined. Because the ACA is still in its infancy and continues to evolve, it is important for policymakers to understand how federally initiated subsidies benefit health plan enrollees. Therefore, our objectives were to compare the plans’ premiums and other key financial attributes (ie, medical deductible and medical maximum out-of-pocket spending), with a focus on the cost-sharing of prescription drug benefits of the second lowest-cost silver plans across geographic rating areas to understand the value of the subsidies in different geographic areas and to compare them with those of average-cost silver plans to measure how much more enrollees would pay if they chose the average-cost silver plan. We used publicly available data from HealthCare.gov for a total of 37 states with federally run or stateR11;federal partnership marketplaces. For consistency, the 12 states and the District of Columbia (ie, California, Colorado, Connecticut, Hawaii, Kentucky, Maryland, Massachusetts, Minnesota, New York, Rhode Island, Vermont, Washington, and the District of Columbia) that ran their own marketplaces and did not report their data to HealthCare.gov were not included. At the time of our data collection in June 2015, data from Idaho were not available. The data contained the information of key dimensions of every health plan offered in the 37 states. We downloaded the complete data set from the site but selected only certain data elements for our analysis. 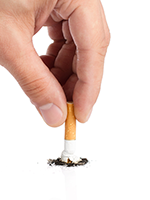 Although the data included 2015 health plan information for individuals and families, we focused only on individuals who were nonsmokers and were aged 21, 27, 30, 40, 50, or 60 years. We also obtained the population of each county from the Census Bureau’s most recently available report at the time of the study (ie, 2013).9 We linked the data by the state and county names. Finally, the data elements included the state; county; metal plan level; issuer name; plan identification; plan marketing name; plan type; geographic rating area; population size; premiums for adults aged 21, 27, 30, 40, 50, and 60 years; medical deductible; medical maximum out-of-pocket spending; and cost-sharing for generic drugs, preferred and nonpreferred brand-name drugs, and specialty drugs. Similar to the previous study,4 because premiums vary across certain characteristics of enrollees (eg, age and tobacco use) within the various geographic rating areas, we used the geographic rating area as our unit of analysis. The number of geographic rating areas ranged from 1 in 3 states (ie, Delaware, New Hampshire, and New Jersey) to 67 in Florida, and the population in the rating areas varied from approximately 8000 in Florida to almost 9 million in New Jersey. As a result, we used the number of people living in those geographic rating areas to calculate the average-weighted premiums; medical deductibles; medical maximum out-of-pocket spending; and cost-sharing for generic drugs, preferred and nonpreferred brand-name drugs, and specialty drugs of the second lowest-cost silver plans and the average-cost silver plan. We divided the data into 3 groups based on the number of health plans in each area (ie, 1-10, 11-20, and ≥21). Because the majority of enrollees selected a silver plan,2,4 we computed the difference in premiums between the average-cost silver plan and the second lowest-cost silver plan in each geographic rating area, and then used it to reflect the additional cost to enrollees across all age-groups if they selected the average-cost silver plan. Similarly, we calculated the difference in other financial attributes between the average-cost silver plan and the second lowest-cost silver plan in each rating area as a measure of the financial consequences (ie, premiums, medical deductibles, and medical maximum out-of-pocket cost) to enrollees when they used healthcare services. 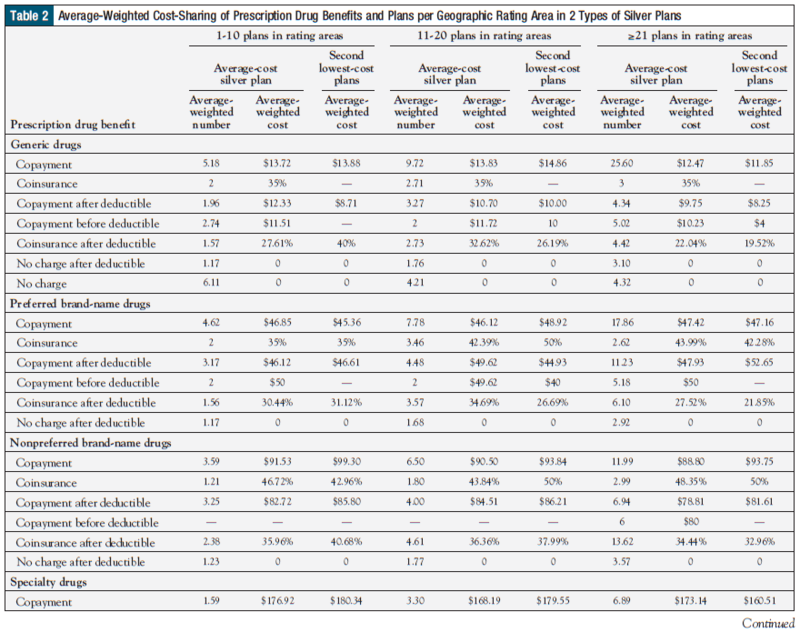 In addition, because the types of cost-sharing for drugs varied within and across the geographic rating areas, we calculated the average-weighted number of health plans for area and the average-weighted cost-sharing separately across the types of cost-sharing for the average-cost silver plan and the second lowest-cost silver plan. 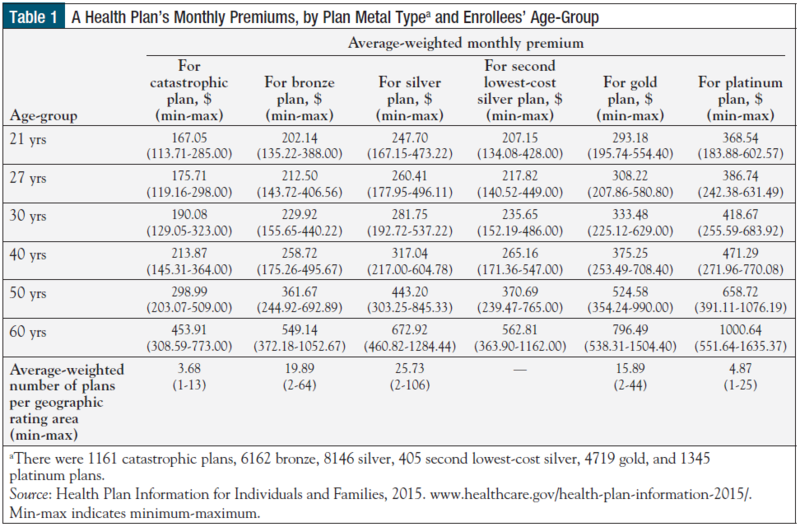 Table 1 shows the health plan monthly premiums and the number of plans across the metal plan types and age-groups. Among all of the health plans analyzed in this study, the highest number of metal plans offered in the government marketplace was silver. Also, the weighted-average number of silver plans offered per geographic rating area was higher than the number in the other metal plans (ie, range 2-106 for the silver plan vs 1-64 for all other metal plans). The monthly premiums within each metal plan and age-group varied widely (eg, $167.05-$453.91 for catastrophic plans and $368.54-$1000.64 for platinum plans). For every metal plan type, the health plan monthly premiums changed by <40% from one age range to another until age 50 years, and then changed by >50% from the age range of 50 to 60 years. Figure 1 shows the average-weighted premiums for the average-cost silver and second lowest-cost silver plans by the number of silver plans in the geographic rating areas and by age-group. Within the same ranges of the number of silver plans, the difference in premiums between the second lowest-cost silver plan and the average-cost silver plan changed gradually until age 50 years (eg, from approximately $37 at age 21 years to approximately $67 at age 50 years in areas with 11-20 silver plans), but changed dramatically at age 60 years (eg, approximately $102 in areas with 11-20 silver plans). Within the same age-groups, all differences in premiums between the second lowest-cost silver plans and the average-cost silver plans were significant (P <.05). The magnitude of the differences varied from approximately $22 to $128 for the overall ranges of the number of plans per geographic rating areas and age-groups, but the differences were smaller in areas with 1 to 10 silver plans and were relatively higher in areas with more than 10 plans. 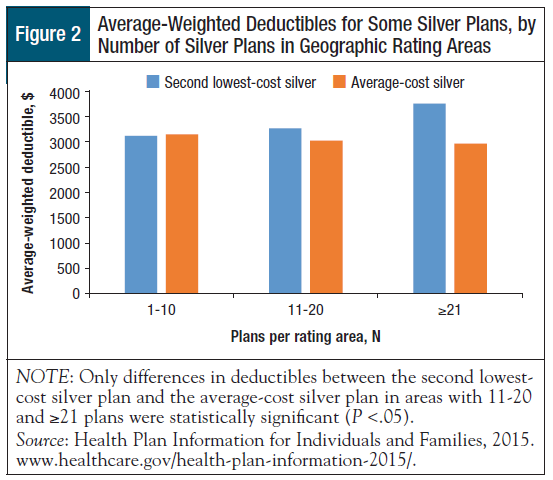 Figure 2 shows the average-weighted deductibles for the average-cost silver and second lowest-cost silver plans by the number of silver plans in the geographic rating areas. Although the average-weighted deductible for the second lowest-cost silver plan was greater as the number of available plans increased, the deductible for the average-cost silver plan was lower as the number of available plans increased. The average-weighted deductibles for the average-cost silver and second lowest-cost silver plans were slightly different (by approximately $28) in areas with 1 to 10 plans (P <.05). The deductible for the second lowest-cost silver plan was greater than the average-cost silver plan in areas with >10 available plans. 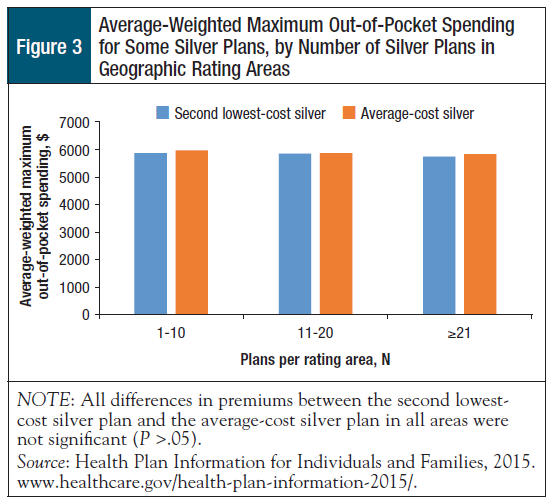 For example, the deductible for the second lowest-cost silver plan was approximately $800 higher than for the average-cost silver plan in areas with >20 plans, and they were significantly different (P <.05). Figure 3 shows the average-weighted maximum out-of-pocket spending for the average-cost silver plans and the second lowest-cost silver plans by the number of silver plans in the geographic rating areas. The differences between the maximum out-of-pocket spending for these 2 types of silver plans ranged from approximately $15 to $102 across areas with different numbers of plans, and they were not significantly different in all areas. Table 2 provides an overview of the drug benefits according to the number of plans available in each area. This table shows the average-weighted cost-sharing amount and the number of plans per geographic rating area for the average-cost silver and second lowest-cost silver plans by the number of silver plans in each area. There were various types of cost-sharing for different drug types (eg, generic, preferred brand-name). From the average-weighted number of plans, copayments were a major type of cost-sharing for generic drugs across geographic areas with different numbers of plans. 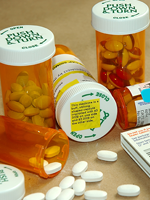 Copayments were also frequently used with other types of drugs, but additional cost-sharing techniques were increasingly used versus those for generic drugs. Copayment after deductible and coinsurance after deductible were often used for preferred brand-name drugs and nonpreferred brand-name drugs, respectively. The co­insurance after deductible was most often used across all of the geographic rating areas for specialty drugs. The average-weighted copayments for the generic and preferred brand-name drugs of the second lowest-cost silver plans increased by approximately $1 to $4 from areas with ≤10 plans to areas with 11 to 20 plans, and subsequently decreased by approximately $2 to $3 in areas with >20 plans; the average-weighted copayments for nonpreferred brand-name drugs and specialty drugs were lower as the number of available plans increased. The average-weighted copayment after deductible for preferred brand-name drugs of the second lowest-cost silver plans decreased by approximately $2 from areas with ≤10 plans to areas with 11 to 20 plans, and subsequently increased by almost $8 in areas with >20 plans; the average-weighted coinsurances after deductible for nonpreferred drugs and specialty drugs were lower as the number of available plans increased. The average-weighted copayment amount significantly increased between generic drugs (approximately $12-$14) and preferred brand-name drugs (approximately $45-$49), nonpreferred brand-name drugs (approximately $89-$100), and specialty drugs across all geographic rating areas (approximately $160-$180). The average-weighted copayments of the second lowest-cost silver plans and average-cost silver plans for the generic and preferred brand-name drugs were different by approximately $1 to $3, whereas the copayments for nonpreferred and specialty drugs varied by approximately $3 to $11 across areas with different numbers of plans. For the preferred brand-name drugs, the average-weighted copayments after deductible of the second lowest-cost silver plans were similar in areas with 1 to 10 and 11 to 20 plans, but the copayment was almost $5 higher than it was for the average-cost silver plan in areas with more than 20 plans. For nonpreferred brand-name and specialty drugs, the average-weighted coinsurance levels after deductible of the second lowest-cost silver plans were higher than those of the average-cost silver plans only in the areas with 1 to 10 and 11 to 20 plans, and were approximately 1% to 4% lower in areas with more than 20 plans. Similar to the results of previous studies,4,6 health plans in the 2015 marketplace had considerable variation in the number of plans offered per geographic rating area and the premiums for each metal plan tier and age-group. Of note, the monthly premiums within the same actuarial value and age-group varied widely. In this study, we reflected that the premium alone may not be a good determination of the health plans’ values. The enrollees needed to consider other plan features (eg, deductible, maximum out-of-pocket spending, and prescription drug benefit) to ensure that the plans had good value. In areas with a larger number of plans, the average-weighted premiums for the second lowest-cost silver plans were lower than for the average-cost silver plans, but their average-weighted deductibles were higher than for the average-cost silver plans. The magnitude of the differences between the premiums and deductibles were larger in areas with a higher number of health plans than in areas with less health plans. Similar to the study by Taylor and colleagues,4 these results suggest that enrollees may need to accept a higher-deductible plan or face lower value of the subsidy if they live in areas with more plans, because they cannot afford a plan with a higher premium. The current study showed that the maximum out-of-pocket spending levels for the second lowest-cost silver plans were similar to those for the average-cost silver plans in all areas, independent of the number of plans. These results may only confirm that the enrollees were in the same metal plan tier and that plans need to cover similar total costs of an average enrollee’s care. However, policymakers should realize that not every enrollee will reach the maximum out-of-pocket spending amount. In this study we investigated the value of the subsidy on the provision of prescription drug benefits. The variation of cost-sharing types and amounts were diverse across drug types and across areas with different numbers of plans. In general, copayments for drugs were the most frequently used cost-sharing method across all of the health plans, especially for generic and preferred brand-name drugs. However, coinsurance after deductible is reached tended to be more common for nonpreferred brand-name and specialty drugs. As expected, the copayment amount increased considerably from generic drugs to preferred or nonpreferred brand-name drugs and specialty drugs in all ranges of number of plans per geographic rating area, because these drugs tend to be more costly or are less preferred by insurers. The copayments for generic and preferred brand-name drugs in the second lowest-cost silver plans fluctuated slightly, whereas the premiums of these plans decreased in areas with a larger number of plans. Therefore, generic and preferred brands hardly affected the value of health plans across these areas. Furthermore, enrollees with a lower coinsurance after deductible for nonpreferred brand-name and specialty drugs in the second lowest-cost silver plans in areas with a larger number of plans may benefit more if they use these 2 drug types after their deductible amount is reached. By contrast, enrollees living in areas with fewer health plans may pay a higher premium with a lower deductible but subsequently pay a higher coinsurance for these drugs. In other words, the value of the subsidy for purchasing a health plan in different areas would depend on the premiums and the deductibles, as well as on the cost-sharing of prescription drugs, especially if enrollees need to receive the nonpreferred and specialty drugs for the long-term. With regard to reducing the variation in plan design and the number of plans offered in each geographic area, the policy suggestions from the study by Taylor and colleagues examining plan benefits are still applicable.4 Eventually, variation in premiums and other financial features of health plans within the same geographic rating area may be reduced, which would equate the subsidy values across the areas and make it easier for enrollees to choose a plan. The results of cost-sharing for prescription drug benefits from this study support this suggestion, because there are several types of cost-sharing and each cost-sharing type behaves differently under the various types of drugs. However, reducing variations in plan designs or changing from tying the subsidy to the premium of the second lowest-cost silver plan in a given geographic rating area to tying it to a standardized plan need to be considered carefully, because standardizing health plan features can be challenging. For prescription drug benefits, reducing variations in health plans in the health insurance marketplace may not be feasible unless policymakers consider a new cost-sharing feature, such as maximum out-of-pocket spending for drugs. This policy option will allow policymakers to standardize drug benefits to a certain degree, will help enrollees understand and choose their plans being better informed, and insurers will still have cost-sharing options to contain drug costs. This study has several limitations. First, we used health plan data alone, which were publicly available from only 37 states at the time the study was conducted; they were not actual enrollment data. The data may not reflect how plan features truly affected the enrollees’ decisions4 and may not represent health plans in other excluded states. It is noteworthy that most of the excluded states were either in the Northeast (Connecticut, Massachusetts, New York, Rhode Island, and Vermont) or on the West Coast (California, Colorado, and Washington). These states provided state-based marketplaces, which tailored their health plans to meet local needs and market conditions. Therefore, the study results should be cautiously applied in those states. Second, only some features of the health plans, including premiums, deductibles, maximum out-of-pocket payments, and cost-sharing of drugs, were analyzed. Other important plan features, such as provider networks and lists of drugs covered, were not included in this study; those features might have affected the enrollees’ decisions. We examined the cost-sharing of each drug group but not the impact of the variations in the covered drugs. Therefore, our results may not provide a complete picture of the drug benefits. Finally, the comparisons of cost-sharing between the second lowest-cost silver plan and the average-cost silver plan could only shed some light on the health plan’s subsidy value, because we could not calculate the average-weighted cost-sharing in the same manner as we did for either health plan’s premium or deductible. Each geographic rating area had various types of cost-sharing, which did not allow for overall comparisons. Although various health plans in the health insurance marketplace have the same actuarial value, each plan has specific features, which enrollees need to carefully consider to determine if they match with their needs. This study shows that, under the current policy, the monetary value of a health insurance subsidy tends to be lower in geographic areas with a larger number of plans, because the deductibles in the second lowest-cost silver plans are higher. In other words, the enrollees who live in these areas generally have to pay higher premiums to obtain the same level of deductible as enrollees who live in areas with fewer plans available. Our study also provides an example of cost-sharing for prescription drug benefits, indicating the value of the subsidy on these benefits across various types of drugs and areas with different numbers of plans. Enrollees receiving nonpreferred brand-name or specialty drugs who reside in geographic areas with more than 20 health plans participating in the marketplace need to consider cost-sharing for these drugs in addition to premiums and deductibles when they choose their health plan. Dr Ngorsuraches received a research grant from Bristol-Myers Squibb. Dr Mort reported no conflicts of interest. 1. Office of the Assistant Secretary for Planning and Evaluation, Department of Health & Human Services. How many individuals might have marketplace coverage after the 2015 open enrollment period? November 10, 2014. http://aspe.hhs.gov/health/reports/2014/Targets/ib_Targets.pdf. Accessed May 30, 2015. 2. Centers for Medicare & Medicaid Services. March 31, 2015 effectuated enrollment snapshot. Fact sheet. June 2, 2015. www.cms.gov/Newsroom/MediaReleaseDatabase/Fact-sheets/2015-Fact-sheets-items/2015-06-02.html. Accessed June 9, 2015. 3. Department of Health & Human Services. Patient Protection and Affordable Care Act; standards related to essential health benefits, actuarial value, and accreditation. Final rule. Fed Regist. 2013;78:12833-12872. 4. Taylor EA, Saltzman E, Bauhoff S, et al. More choice in health insurance marketplaces may reduce the value of the subsidies available to low-income enrollees. Health Aff (Millwood). 2015;34:104-110. 5. Office of the Assistant Secretary for Planning and Evaluation, Department of Health & Human Services. Health insurance marketplace: summary enrollment report for the initial annual open enrollment period. ASPE issue brief. May 1, 2014. https://aspe.hhs.gov/sites/default/files/pdf/76876/ib_2014Apr_ enrollment.pdf. Accessed June 9, 2015. 6. Jacobs PD, Banthin JS, Trachtman S. Insurer competition in federally run marketplaces is associated with lower premiums. Health Aff (Millwood). 2015;34:2027-2035. 7. Kreling DH, Wiederholt JB. Selecting health insurance: the importance of prescription drug coverage and pharmacy factors in consumer decision making. J Pharm Mark Manage. 1987;1:3-18. 8. Jackson JE, Doescher MP, Saver BG, Fishman P. Prescription drug coverage, health, and medication acquisition among seniors with one or more chronic conditions. Med Care. 2004;42:1056-1065. 9. United States Census Bureau. Population estimates: county totals dataset: population, population change and estimated components of population change: April 1, 2010 to July 1, 2014. www.census.gov/popest/data/counties/totals/2014/CO-EST2014-alldata.html. Accessed July 3, 2015. By the time of this publication, the fourth open enrollment of the Affordable Care Act (ACA)-initiated health insurance exchanges or marketplace with health plans offering subsidies will be underway. This year’s enrollment will be interesting in light of Aetna and UnitedHealth Group announcing that they are reducing participation in the exchanges this year.1 This could potentially affect patients, payers, providers, pharmaceutical companies, and government policy in the future. PATIENTS: Before enrolling in the marketplace, patients need to understand their health status, because of the cost of deductibles, premiums, and copays for prescription drugs and office visits. This will be especially critical this year, because many payers are leaving the exchanges, and the potential for increasing cost is ever present. A transparency tool to help patients make very educated decisions on cost and quality of health plans will be critical in the future. With the increasing cost of prescription drugs, if patients do not examine their prescription drug benefit carefully, they may have to cover more of the cost out of their own pocket. For patients with limited incomes, this could have the unintentional consequence of creating patients’ nonadherence to their medications, such as not filling a prescription, because of cost. Cost-related nonadherence could have downstream effects, such as increasing hospital readmissions, which can in turn increase the overall cost of the healthcare system. POLICYMAKERS: This year will be very critical for the ACA during an election year. With several insurance companies reducing participation in many of the market exchanges,1 patients will have fewer options than in previous years. These limited options could have downstream effects that may affect every aspect of the system, including patients’ overall health, treatment adherence, and overall healthcare costs. Continued analytic research, such as this study,2 will be critical to conduct every year, to look closely at how the ACA is performing in the insurance marketplace, and to improve healthcare for patients, especially because a patient’s geographic location affects the value of his or her subsidy because of the variation in plan options in the marketplace.2 Demonstrating cost-effectiveness will be critical for everyone involved in policymaking decisions on all levels of government and business. 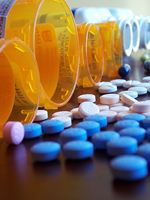 PHARMACEUTICAL COMPANIES: Like any industry that could be affected by health plan benefit design, pharmaceutical companies will have an interest in understanding how this impacts them. Any prescription benefit design that limits the options between generic, preferred brand-name, and nonpreferred brand-name drugs because of copayments or out-of-pocket maximum spending is critical to monitor market-share performance and overall business performance. Why is this important? Healthy competition between pharmaceutical companies is useful to keep cost down and maintain drug choice options available to patients; it also allows these companies the ability to continue investing in research and development to find new breakthrough treatments to improve the lives of patients. 1. Kodjak A. Aetna joins other major insurers in pulling back from Obamacare. August 16, 2016. www.npr.org/sections/health-shots/2016/08/16/490207169/aetna-joins-other-major-insurers-in-pulling-back-from-obamacare.htm. Accessed October 3, 2016. 2. Ngorsuraches S, Mort J. Examining the value of subsidies of health plans and cost-sharing for prescription drugs in the health insurance marketplace. Am Health Drug Benefits. 2016;9(7):368-377.